Hooray!! I've made a Christmas card. I made it with several different dies, the one behind the candles is the Marianne Creatable Floral Circle which I cut with gold mirror card. The candles are also a Marianne Creatable die to which I have added Glitter Snow. The leaves are cheery Lynn s Fir Branch. I really appreciate you taking the time to visit. This is the card I made for my MIL's Birthday this year. It's not a very good Picture of it with some of it being to light and other bits too dark to see properly. I was quite pleased with the way it turned out though. 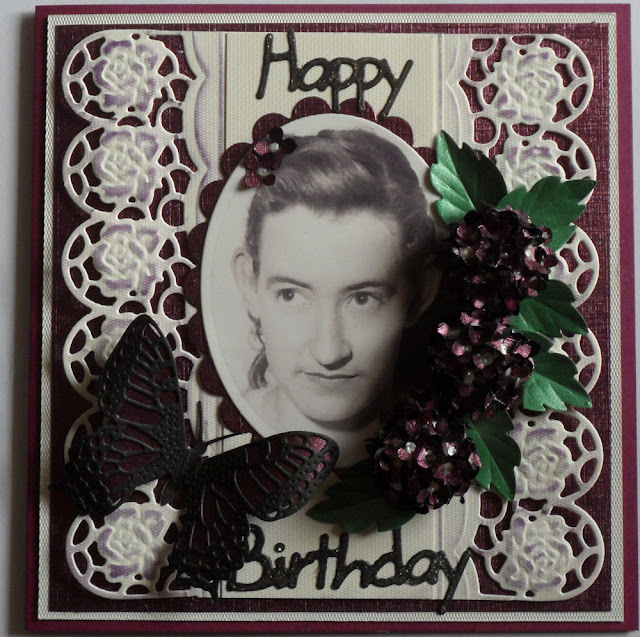 I printed a photo of her when she was younger and cut it out with Spellbinders Ovals. The butterfly is a Cheery Lynn Die which I cut out with black and backed it with the same paper as the background. The hydrangea's I made by cutting a polystyrene ball (half inch) in half and gluing on flowers from the Martha Stewart hydrangea punch (the smallest ones) these i also cut from the same paper as the background and added drops if liquid pearls to the centers. The Happy Birthday is also a Marianne Creatable Die . 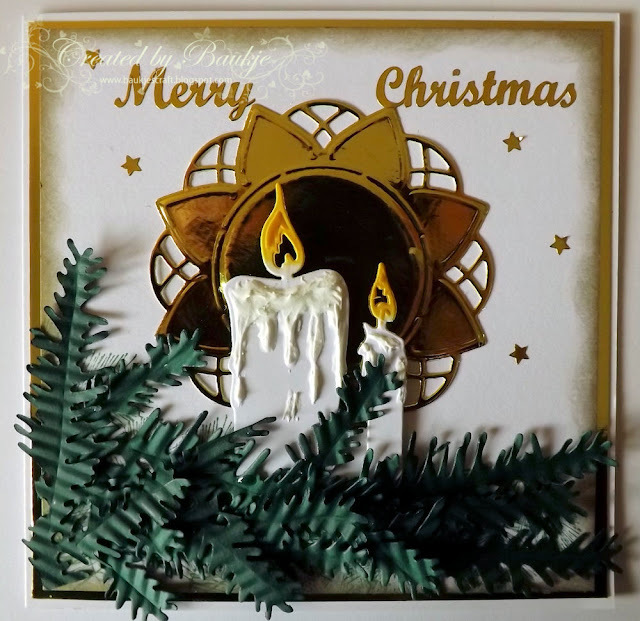 Hi Everyone, This is the card I made for my godson Callam this year. 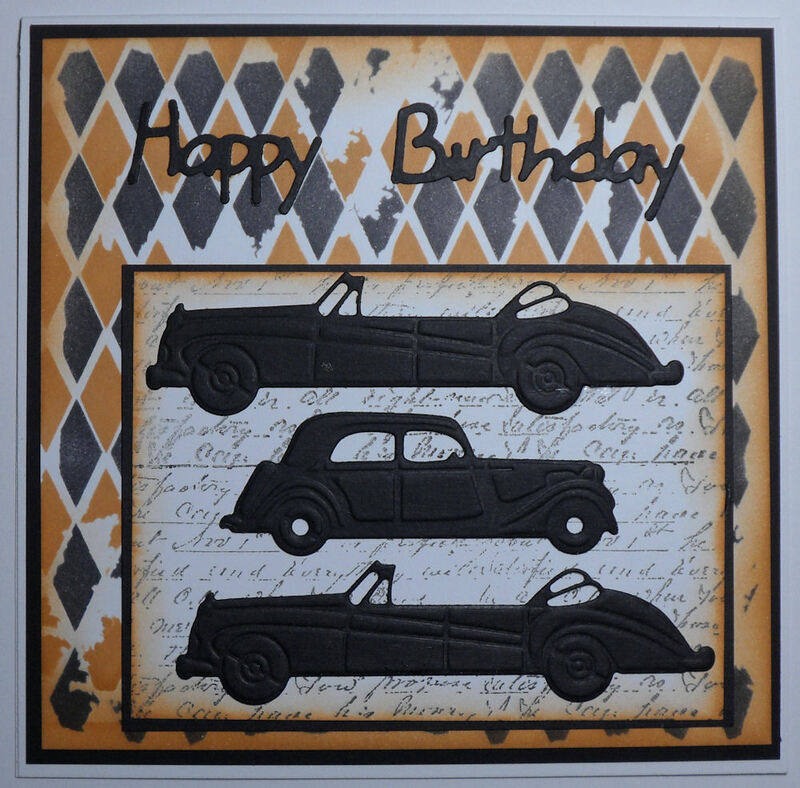 I made the background with the Crafters Workshop Harlequin template. I first sponged over the template with Memento Tuxedo black, then moved the template down a little and sponged again with Memento Peanut Brittle. The script behind the cards is a KaiserCraft stamp which was stamped with Memento Tuxedo black ink. The cars are the Marianne Design Classic Cars Die set ( out of stock )and the Happy Birthday sentiment is also a Marianne Design Die. 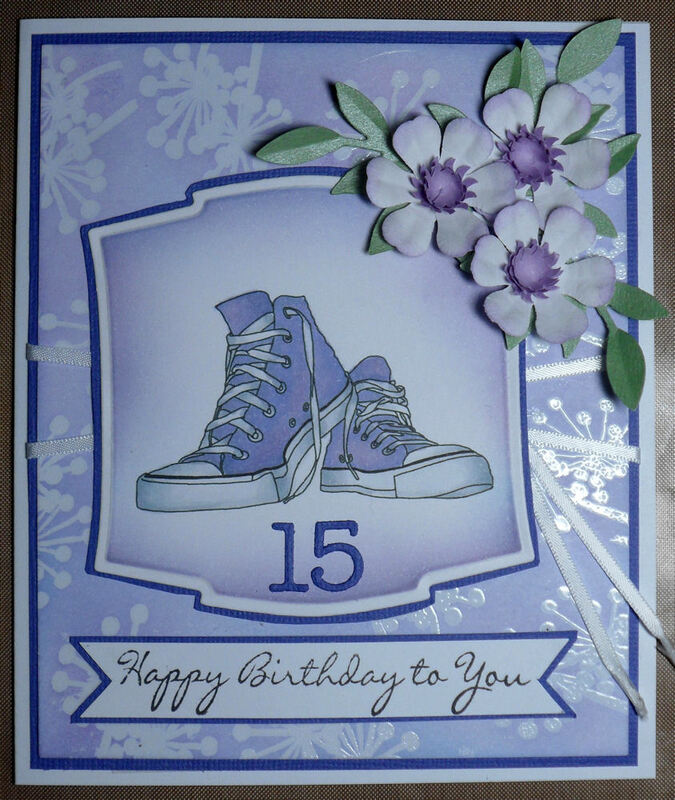 Hello, our grand daughter Chloe had a 15th birthday recently and here is my card I made for her. Chloe loves her high top sneakers which I thought were purple but it turns out they are blue (I always thought I was a very observant, but apparently I'm not), they were coloured with copic and cut out with Spellbinders Labels 2. The background I did with the emboss resist method using Memento Lulu Lavender and summer Sky to get the blue violet colour I wanted to match the copics used. A bit of thin ribbon to represent laces and I made some of my friend Angie's Peary flowers and used Sizzix Little leaves for the leaves.